The South African Hockey Association have today announced the South African Women’s Hockey Squad. This squad will be the first under coach Robin van Ginkel and will be used to select the final tournament squads for the FIH Open Series Final in Valencia in June. With Tokyo 2020 having just passed the 500 days away threshold, the excitement for the various qualification tournaments is palpable. South Africa will head to Valencia with the objective of finishing in the top 2. The African champions will take on Italy, Wales and Thailand in Pool B of the Valencia tournament, with hosts Spain partnered in Pool A with Belarus, Canada and Namibia. 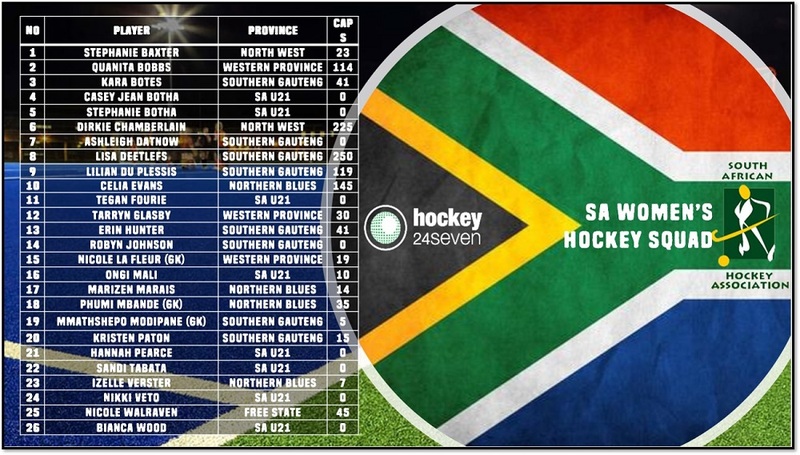 The 26-player team announced features an exciting blend of new players with Robyn Johnson, Sandi Tabata, Ashleigh Datnow, Nikki Veto, Stephanie Botha, Casey-Jean Botha, Bianca Wood, Hannah Pearse and Tegan Fourie all looking to earn their first caps for the country. Alongside the new faces is also a blend of great experience with Lisa Deetlefs, Erin Hunter, Nicole Walraven, Quanita Bobbs, Phumi Mbande and Tarryn Glasby among the players that van Ginkel will look to blend the newcomers to International hockey into the team.